Amanda Earl is a poet, publisher and pornographer. She's the editor of Bywords.ca & the fallen angel of AngelHousePress. In 2012/2013 her poetry has appeared locally in the Peter F. Yacht Club, & In/Words Magazine (as well as three chapbooks with above/ground press) & in literary magazines in Windsor, Calgary, Toronto, the UK, France, the USA and Australia. For more info, please visit amandaearl.com or connect with Amanda on Twitter @KikiFolle. 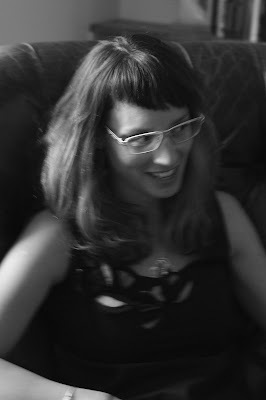 Brecken Hancock’s [pictured] poetry, essays, interviews, and reviews have appeared in Riddle Fence, Event, CV2, Grain, and Studies in Canadian Literature. She is Reviews Editor for Arc Poetry Magazine and Interviews Editor for Canadian Women in the Literary Arts. The Art of Plumbing, her most recent chapbook, is out with above/ground press and her first full-length manuscript of poems, Broom Broom, is forthcoming with Coach House Books. She lives and walks dogs in Ottawa. David O'Meara lives in Ottawa, Ontario. He is the author of three collections of poetry, including most recently A Pretty Sight (Coach House Books, 2013), and a play, Disaster, nominated for four Rideau Awards. His poetry has been shortlisted for the Gerald Lampert Award, the ReLit Award, the Trillium Book Award, a National Magazine Award, and he has won the Archibald Lampman Award twice. He is the director of the Plan 99 Reading Series, Artistic Director of VERSeFest (www.versefest.ca) and was the Canadian judge for the 2012 Griffin Poetry Prize. Most of the talks in this series subsequently appear online in seventeen seconds: a journal of poetry and poetics, including previous talks by Monty Reid, Marcus McCann, Barry McKinnon, Cameron Anstee, Pearl Pirie, Gil McElroy and Nicole Markotić.